It is a requirement in all schools that each student should wear their uniform properly; and hence I have too for the sake of it. But wearing a uniform simply holds one's creativity on dressing fashionably in going to school especially for college students. Only if your school requires a uniform for all students, but for most state universities and other institutions, they are lucky to have a free uniform the whole school year round. Nevertheless, for schools with uniform, they have a 1 free uniform school day every Wednesday. Since I have my own job while taking my field of expertise, I was granted to receive a privilege card on which I can go to school anytime even without wearing our school prescribe uniform. This breaks my horizon to flaunt my personality on the way I dress. If you're a student, of course, in few years’ time you will not be what you are now, you are becoming – a young professional. And there’s more to style than just having few shirts, polo, jeans and a watch. It’s about time to transform you into a contemporary, smart, well put together, man. 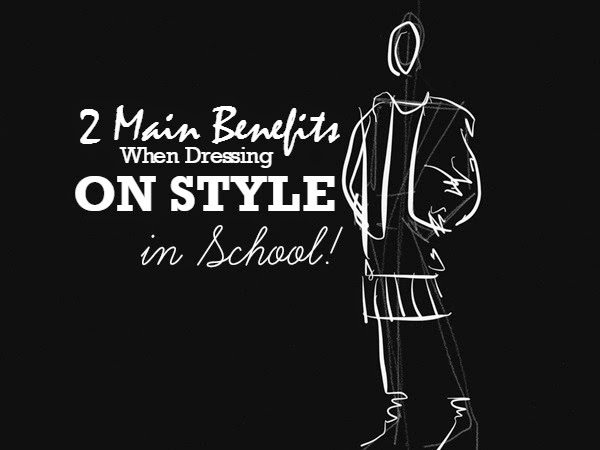 So, here are the two main factors to benefit when you go to school well-dressed and on style. Respect – A one good reason why you have to dress properly like a real man; not a boy. So you have to reassess yourself and your closet. This I am very certain true. I am wearing a sharp leather shoes, button shirt and a good fit jeans; my typical school style. It shows and draws an impression that I am doing my thing seriously which in turn helps me gain respect from my peers and most importantly from my professors. The latter would be making me stand out in class. Confidence – For me, college is a serious business and I am matching that belief by dressing properly. With that, I am able to easily do school chores and am more ready to tackle the day’s tasks. I am more composed and alert. If you think it’s impossible, then, you better try it yourself and see that when dressing properly in school, you will look smart and sharp oozing with confidence and good vibes. This I am lucky, I enjoy going to school that apart from gaining knowledge, I dressed to kill. Figuratively. And literally, men college students are some of the worst dressed people compared to female college students who are very careful on the way they look. You are no longer a student after college, so as early as now, you better change your mentality and go dress properly. This post will just serves as guidance on what college students can benefit when dressing properly, and the aforementioned are just what can boost you; and for you to make at least a small change in your wardrobe that will lead to a big bounce on improving ones physical and personal presentation. For sure, there will be a little by little effect; and in no time without even noticing, you will just come to realize that you have elevated your personal style. I purchased a pair of Gibi like the one on this page, would like to get another pair of them shipped to me in the USA. Can you purchase them online? if you see no details in shipping to USA, hit me on my email: gemtadefa@gmail.com so I can forward you directly to Gibi Shoes, for you to buy your new pair of gibi kicks. hoody shirt couple availabla pa po ba 2? Visit zalora.com.ph for couple shirt availability.